The growing mobility of people, data and infrastructures is presenting media with new challenges. Where virtuality was till the centre of attention in immobile use, smart-phones, in particular, are currently showing us how central social connectivity, contextual sensing, micro-coordination, and haptic feedback are to our understanding of media practices. At the same time, a variety of phenomena that could be understood as mobile media, such as map apps or connected vehicles, reveal that more and more infrastructures, goods and tools have to be digital and networked in order to make a mediation process possible, as actually portrayed with the Internet of Things. Thus, what this conference aims to focus on, is the specifities of certain media as forms for cooperation. Mobile media not only require mobile methods, they also reveal a framework for cultural imaginations of shared motion, traces and infrastructures. Collaborative, collective and participative forms of cartography, for instance, have been of interest in geography for decades. Can we therefore say that the crowdsourcing of geodata that allows mobile navigation apps to function as a »social medium«, is referring back to historical practices in collaborative cartography? 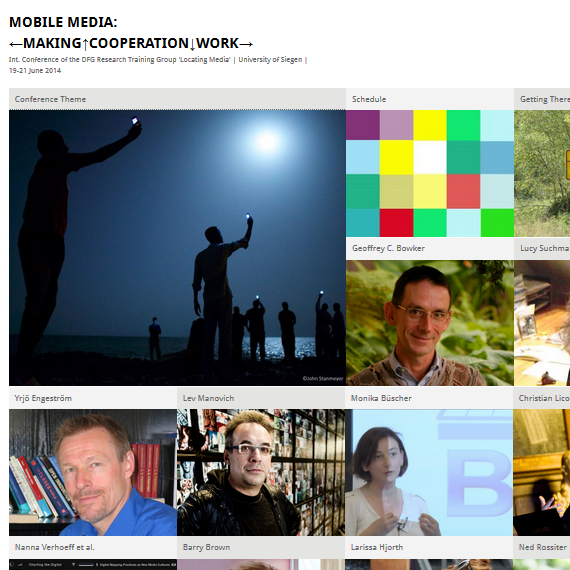 This conference investigates whether mobile networking has changed our cooperative media practices. How do collaboration, cooperation, and coordination of people, things, and signs shape techno-social situations of virtual co-presence or connected viewing, and vice versa? Are mobilized visual representations of instructions and infrastructures sufficient to create communities of practice? Mobile media transform an activity stream into a data collection that is processed and reprocessed to tease out reflexive practices. These collections are the »compactants«, as David M. Berry would say, of today’s software culture. Our personal, public, hidden, or classified data collections are computational and, at the same time, companion actants that are adding encounter value, to the old values of use and exchange in relations of analog media and the labor processes they entail. Thus, what distinction can the mobile of mobile media infer for the analysis of practices which increasingly blur the boundaries between online and offline spaces, between going online and being online? With augmented reality smartphone applications, such as Acrossair, Layar or Wikitude, a new generation of users browse data directly, as it is represented on the screen, within their spatial context off the screen. What does that mean for increasingly mobile media experiences? How do navigational screens and their visual language fixate the relationship between on-screen and off-screen space as well as micro and macro space? If, as Tim Ingold puts it, »we know as we go«, and if the basis of all knowing lies in bodily movement, are we in the process of moving towards a navigational essentialism – a nomadic epistemology – that could be termed as a »navigational turn« in our media practices? Socially shared traces could be not only an effect, but also an important cultural indicator for such a development. Are route maps therefore becoming the focal point of investigations, as they are used both in the analog and the digital worlds? Spaces transversed by mobile media reveal new questions on the media-anthropological significance of lines, curves, points and grids as basic forms of media expression, shifting the perspective from the whole (networked) picture to the way in which traces and selected »drawing groups together« are performed in situ, as practices. The current interest in ethnomethodological and ANT-based media theories corresponds precisely to this interest, namely, to reveal the inextricable ambiguity of data detection, technological infrastructure and their representation. As such, the decorative art of mobile media and its integration into everyday life reveals that it is, and always was, a medium of the en passant, which has qualities that are far more summative than representative. Do the global players of social networking and big data constitute a new avantgarde that gives rise to a commonly shared society of traceability? Can we therefore speak of a cooperative a priori of media as a result of this mobilization? Media are created through cooperation and, simultaneously, serve as a condition for cooperation and corporation by the agency of actors. This conference seeks theoretically informed analyses that question the spatial effects, cultural meanings, aesthetic theory, social anthropology, and technological economy of media in this expanded field of cooperative presence.